CONTENTS ONLY - does not include container bag. 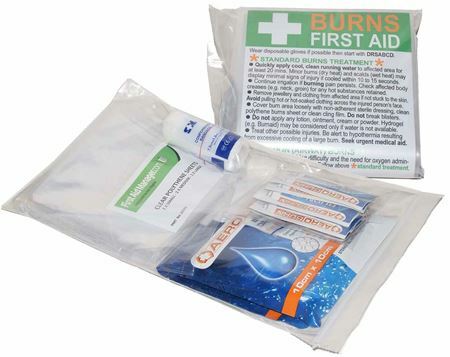 Compact travel kit based on the National Safe Work Australia Code with fewer multiple units, as approved by the Australian Federal Government Department for Environment and Energy for personal use in work situations and where a first aid kit is required when overseas, including easier passing through airport customs and security*. Very compact and light-weight - less than 500g * Although the content of this kit has been constructed and trialed carefully for trouble-free passage through customs and airports around the world, including approval for overseas use by the Federal Department of Conservation and Energy, we can not guarantee this will always be the case with all inspection personnel or in all countries. 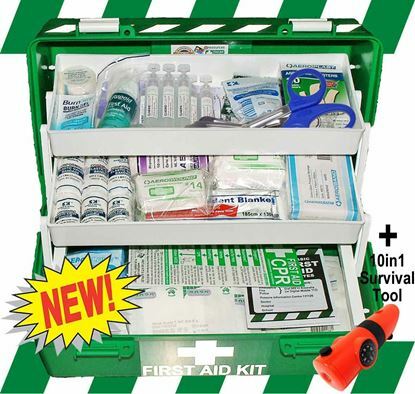 Compact kit based on the National SafeWork Australia Code with fewer multiple units, as approved by the Australian Federal Government Department for Environment and Energy for personal use in work situations and where a first aid kit is required when overseas, including easier passing through airport customs and security*. Very compact and light-weight - 22cmW x 14cmH x 11cmD, 740g with all listed contents. Carefully and cleverly organised according to item type and emergency need. Flexible enough to fit inside other luggage or on a belt via the rear wide thick loops. Neatly packed in our new light-weight premium kit bag made from top quality robust 600D water repelling canvas material with industrial dual zips, fold-out multiple see-through compartments (you instantly see all product labels as the individual manufacturers intended) and a large deep, separate, internal, dual zipped, see-through compartment. High visibility day time and night time reflective panel on the front. Dedicated sections for categories and emergency order. * Although the content of this kit has been constructed and trialed carefully for trouble-free passage through customs and airports around the world, including approval for overseas use by the Federal Department of Conservation and Energy, we can not guarantee this will always be the case with all inspection personnel or in all countries. 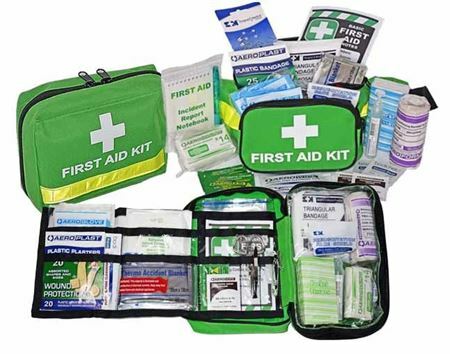 Essential first aid kit contents for individuals and small sporting teams. Very compact for easy transportation between venues with essential contents to cover core risks. 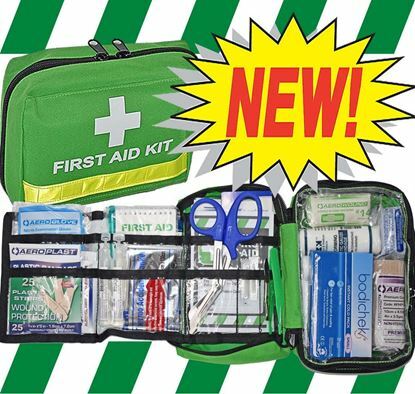 Essential compact first aid kit for individuals and small sporting teams such as basketball, netball, cricket, tennis etc.. Very compact for easy transportation between venues with essential contents to cover core risks during play both indoors and outdoors. Small, robust premium green zip bag with multiple internal easy see-through compartments, external signage according to Australian Standards and high-visibility reflective stripe. This kit is recommended for individuals and small teams. If you need a larger club based kit, please see our large sport kit FAKSLM. Size approx. 20cmL x 13cmH x 11cmW and only 850g weight. 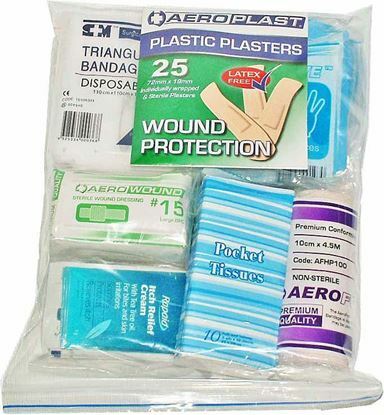 This kit is great value when you consider its contents - in particular the strapping tape, stainless steel instruments and assorted antiseptics and dressings. You will not find a kit like this anywhere else apart from our own company website. Manufactured in Australia using only brand new quality components made in Australia and/or sourced overseas. If you are coaching or managing sporting teams, then this kit could help to alleviate possible injury at a critical time. Several items exclusively made in Australia for our tough conditions that you won't find in imported kits! Best of all, you can buy all items individually from us if you ever need replacements. 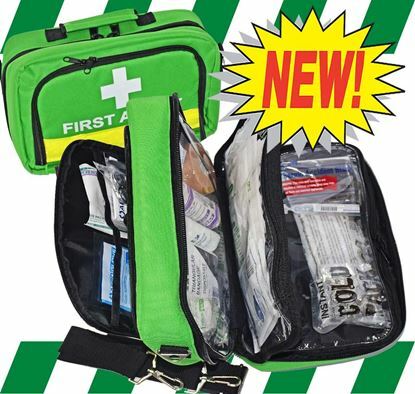 Essential compact first aid kit for individuals and small sporting teams such as basketball, netball, cricket, tennis etc.. Very compact for easy transportation between venues with essential contents to cover core risks during play both indoors and outdoors. CONTENTS ONLY - does not include first aid container. 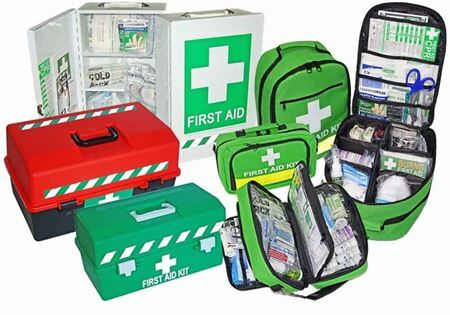 A large sports first aid kit for teams and clubs. Also Complies with National Safe Work Australia Code for essential workplace contents including outdoor module, Australian Standards Class A, AS2675, Sports Module and extra items to meet the needs of basic sports related injuries. A large sports first aid kit for teams and clubs. Also Complies with National Safe Work Australia Code for essential workplace contents including outdoor module, Australian Standards Class A, AS2675, Sports Module and extra items to meet the needs of basic sports related injuries. 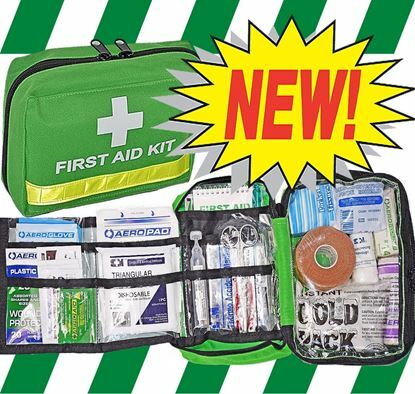 A large sports first aid kit for teams and clubs in our First Aid Box Medium with 2 fold-out trays and 3M reflective top quality weather-proof vinyl first aid striping on 2 sides, and reflective First Aid Kit label complying with Australian Standards. 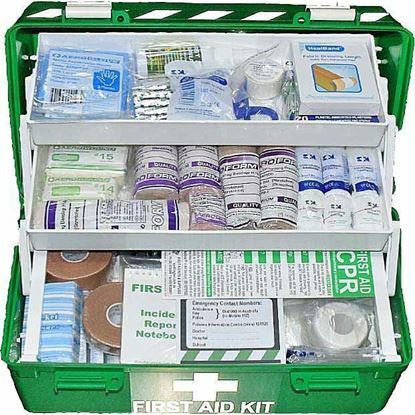 A large sports first aid kit for teams and clubs in our large box with 6 fold-out trays and adjustable dividers. 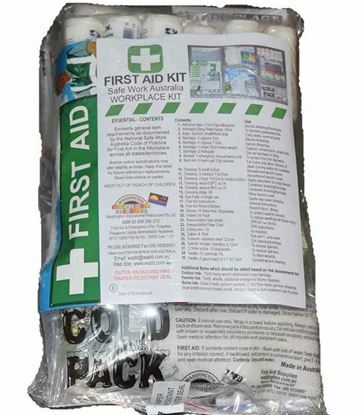 Supplied with 3M reflective top quality weather-proof vinyl first aid striping on 3 sides, and quality First Aid Kit label complying with Australian Standards for first aid labelling. Meets National SafeWork Australia Code for essential workplace contents including outdoor module, Australian Standards Class A, AS2675, Sports Module and extra items to meet the needs of basic sports related injuries. 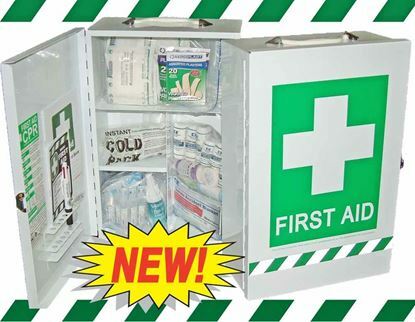 A large sports first aid kit for teams and clubs supplied in a metal wall cabinet with large weatherproof signs and 3M reflective vinyl striping, complying with Australian Standards for first aid signage.